What Are The Best Horse Saddle Bags On The Market? When you are out on the trail, you may need to carry a few things with you. For that, having a saddlebag is a great idea. Today, we get a variety of saddlebags from high-tech to traditional saddlebags. Saddlebags come in a variety of sizes, colors, shapes, and materials. It is very important to choose the right saddlebag as depending on the saddlebag, you can carry the most gear with the least bulk and weight so that your horse doesn’t get exhausted. When you are out on your horse, you may need a variety of items like food, first aid kits, water, hoof boots, hoof supplements, and halters. Having a saddlebag makes sure that you can carry along all the items that you need. The Weaver Leather Saddle Bag is very durable and is well made. It has a polyurethane coating which makes it weather-resistant. It has webbing straps that are adjustable. This increases the stability of the saddle bag. The mounting grommets are nickel plated. It is very spacious and you can store a lot of things in it. Durable: The Weaver Leather Saddle Bag is made of excellent material and is weather-resistant. The insulation is very good and the saddle bag is made from 600D polyester. This makes the saddle bag very strong. The polyurethane coating makes it weather-resistant. Spacious: The Weaver Leather saddle bag has excellent pocket options and the bag is spacious and roomy. It has two main compartments which are padded. One has an insulated insert which is perfect for drinks and food. The other has additional interior pockets. Both the compartments have front pockets and the flap has a quick-release buckle. You can keep small items like your cell phone, keys or camera in the side pockets which are easily accessible. Stability: The webbing straps which are adjustable increase the stability of the saddle bag. Colors: The saddle bag comes in four colors of black, brown, orange and camouflage. Cup holders: The cup holders are at the back rather than in the front which would have made it easier for the rider to use. The Weaver Leather Trail Gear Saddle Bag is an excellent saddle bag as it is durable, spacious and very stable. It has compartments and the insulation is great so you can keep your drinks cold and enjoy it after a long, hard ride. The Weaver Leather Chap Saddle Bag is a work of art. It is very aesthetic and is made from chap leather which is top grain. It is wide so you can store more things in it. The saddle bag is hand stitched from inside so the seams are smooth and even. You can use the bag on motorcycles or on saddles of horses. It is made in Mt. Hope, Ohio and the quality is excellent. Soft, high-quality leather: The saddle bag is made of soft, high-quality chap leather which is great to use. The leather is soft but very strong and durable and will last for a long time. Stylish look: The look of the Weaver Leather Chap Saddle Bag is impressive as it has a great finish and the saddle bag is hand-stitched. The shade is darker than the one shown in the image but it has a very impressive look. Spacious: The Weaver Leather Chap Saddle Bag is very spacious and you can store a lot of things in it. The length is 11″, the width is 3-1/2″ and the height is 12″ which makes it more than sufficient to carry a lot of things. Price: The price is the only issue with the Weaver Leather Chap Saddle Bag but considering that it is made of high-quality chap leather and is handmade in the United States, it is worth it. If you are looking for a high-quality saddle bag which looks excellent and is very durable, then you should go for the Weaver Leather Chap Saddle Bag. It is expensive but is well worth its price as it is handcrafted and is made of the best chap leather available. The Cashel Quality Deluxe Medium Horse Saddle Pommel Horn Bag has padded pockets which are insulated and have quick clip buckles. It has hook-and-loop straps which can be attached around the pommel of your horse. 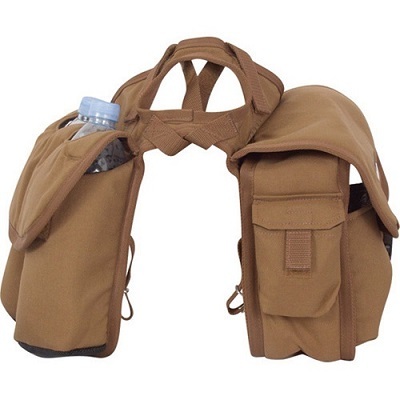 You can carry two water bottles and it also has a pocket for a camera or a cell phone. Tough: The Cashel Horse Saddle Pommel Horn Bag is very tough and is very durable. It is made of 600 Denier polyester materials. A reviewer online mentioned that he rode through thorns in the desert and his shirt was torn to shreds but the saddle bag was intact. Multiple pockets: The Cashel Horse Saddle Pommel Horn Bag has a wide variety of pockets so you can easily place the various things you need on your ride. It has insulated padded pockets for drinks and food. It has two pockets for water bottles and it as a pocket to keep your cell phone or camera. Colors: It comes in four colors so you can choose from black, brown, camouflage and hot-leaf camouflage. Not weather-resistant: Though the material used is great, it is not weather-resistant and you need to keep this in mind if you are carrying equipment which is vulnerable to harsh weather. The Cashel Horse Saddle Pommel Horn Bag is tough and spacious and you can use it to carry multiple things. It is made of strong material and is durable. 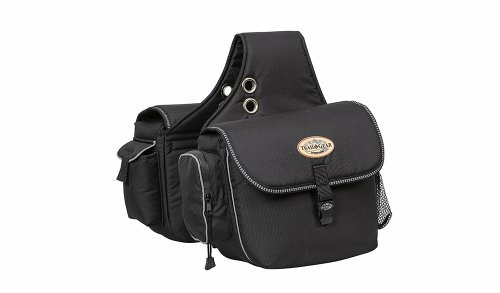 If you are not carrying sensitive equipment then you can definitely consider this saddle bag. 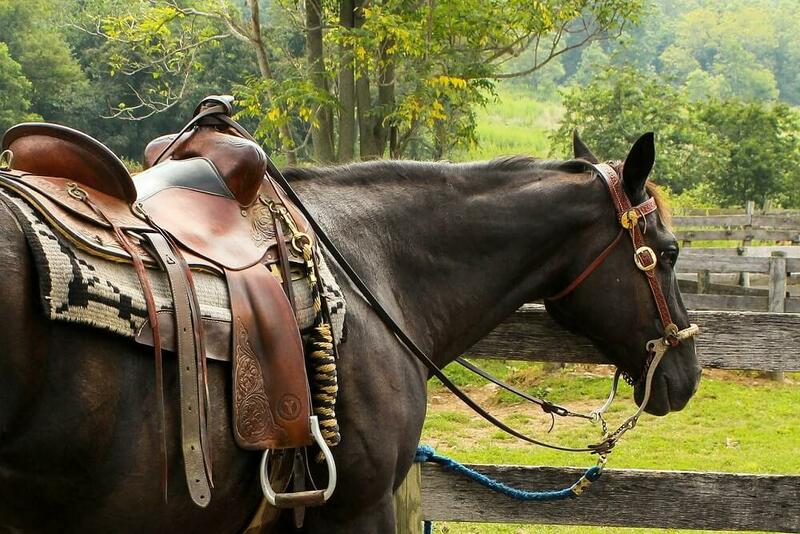 Having a saddlebag is very important when you are riding your horse on the trail. You can carry essentials like water, a first aid kit, etc. If you are looking for an all-purpose high quality, durable saddle bag then go for the Weaver Leather Trail Gear Saddle Bag. If you want a saddle bag that is made of excellent material and looks great and you don’t mind paying more, then go for the handcrafted Weaver Chap Leather Saddle Bag. 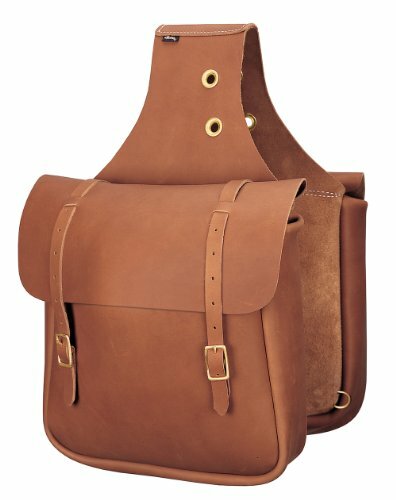 If you want a tough and spacious saddle bag and are not carrying sensitive material then you can buy the Cashel Horse Saddle Pommel Horn Bag. I feel like this type of purchase would be a trial and error thing. Even if I feel there is a functionality to a saddle or the bags, it would have to come down to me trying them out. Either way, this is a good list of options to start with.